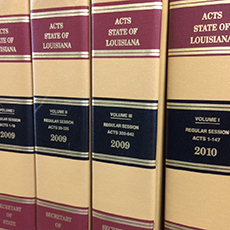 The David R. Poynter Legislative Research Library , under the direction of Frances Carlson Thomas, provides research and information services to the members and staff of the Louisiana Legislature. The library's PULS Line gives citizens information on the legislative process. More information on library resources, including the PULS Line phone numbers, is available at the library's website .